the test series between Pakistan and England resulted in 2-0 victory for Pakistan in the UAE. Now its time for the shorter format of ODI series between both teams. both teams are set to play three ODI matches start Wednesday 11th November 2015.
the first ODI will be played in Abu Dhabi at 4 PM in the evening. in ODI format both sides have several different players Including different captains. England is headed by Eoin Morgan and Pakistan's captain is young Azhar Ali. Azhar Ali has said that we will show good performance against English team just like in the test series. He also said that we will try to target English spinners. He also said that it is good to have experienced player like Younus Khan in the team. 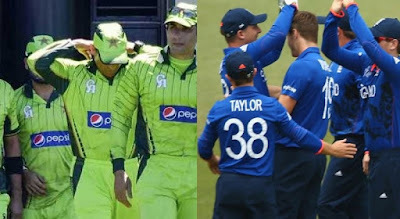 head to head both teams played 72 ODI matches. Pakistan won 28 and England won 42.